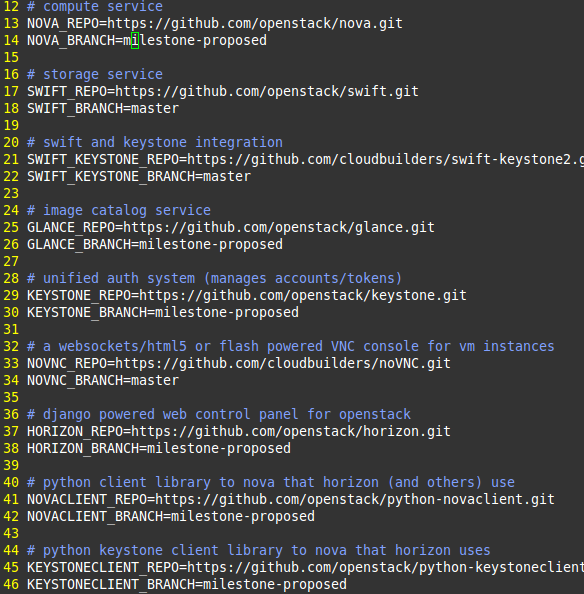 This past week, the first release candidates of a number of OpenStack projects was released. From this point until the OpenStack Design Summit, we are pretty much focused on testing the release candidates. One way you can help out is to test the release candidate code, and this article will walk you through doing that with the Devstack and Tempest projects. 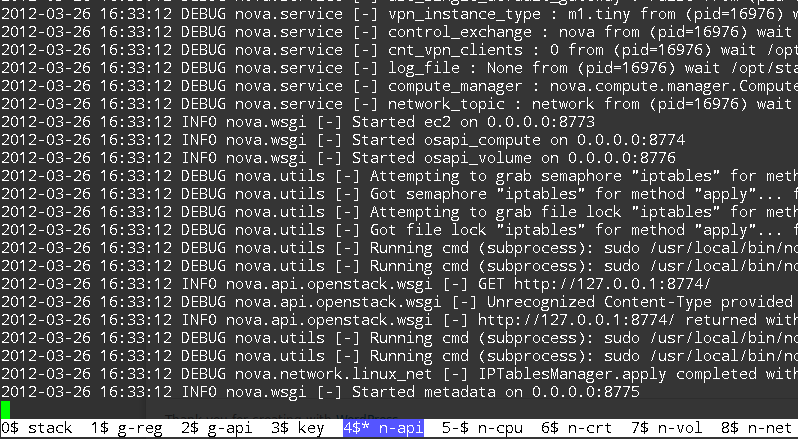 The first line instructs devstack to disable the default ratelimit middleware in the Nova API server. We need to do this because Tempest issues hundreds of API requests in a short amount of time as it runs its tests. If we don’t do this, Tempest will take a much longer time to run and you will likely get test failures with a bunch of overLimitFault messages. stack.sh completed in 517 seconds. Switch screen windows using the <Ctrl>-a NUM key combination, where NUM is the number of the screen window you see at the bottom of your console. Type <Ctrl>-a d to detach from your screen session. The screenshot below shows what your screen session may look like. In the screenshot, I’ve hit <Ctrl>-a 4 to switch to the n-api screen window which is showing the Nova API server daemon output. The Tempest project is an integration test suite for the OpenStack projects. Personally, in my testing setup at home, I run Tempest from a different machine on my local network than the machine that I run devstack on. However, you are free to run Tempest on the same machine you just installed Devstack on. Once cloned, change directory into tempest. Tempest needs some information about your OpenStack environment to run properly. Because Tempest executes a series of API commands against the OpenStack environment, it needs to know where to find the main Compute API endpoint or where it can find the Keystone server that can return a service catalog. In addition, Tempest needs to know the UUID of the base image(s) that Devstack downloaded and installed in the Glance server. Create the tempest configuration file by copying the sample config file included in Tempest $tempest_dir/etc/tempest.conf.sample. Of course, you will want to replace the appropriate parts of the call above with your own environment. In my case above, my devstack environment is running on a host 192.168.1.98 and I’m accessing Glance with an “admin” user in an “admin” tenant with a password of “pass”. Copy the UUID identifier of the image that is returned from the command above (in my case, that UUID is 99a48bc4-d356-4b4d-95d4-650f707699c2). You will want to replace the various configuration option values with ones that correspond to your environment. For the image_ref and image_ref_alt values in the [compute] scetion of the config file, use the UUID you copied from above. The only thing left to do is fire Tempest at your OpenStack environment. Below, I’m executing Tempest in verbose mode. Nosetests is our standard test runner. After you’re done running Tempest — and hopefully everything runs OK — feel free to hit your Devstack Horizon dashboard and log in as your demo user. Unless you made some changes when installing Devstack above, your Horizon dashboard will be available at http://$DEVSTACK_HOST_IP. If you encounter any test failures or issues, please be sure to log bugs for the appropriate project! Likely, you will hit two issues: the first is that you will likely hit the quote limits for your demo user because multiple processes will be creating instances and volumes. You can remedy this by altering the quotas for the tenant you are running the compute tests with. I’ve not quite gotten to the bottom of this, but there seems to be a race condition that gets triggered in the Compute API when a similar request is received nearly simulataneously. I can reliably reproduce the above error by simply adding --processes=2 to my invocation of Tempest. I believe there is an issue with the seeding of identifiers, but it’s just a guess. I still have to figure it out. But in the meantime, be aware of the issue. 1. 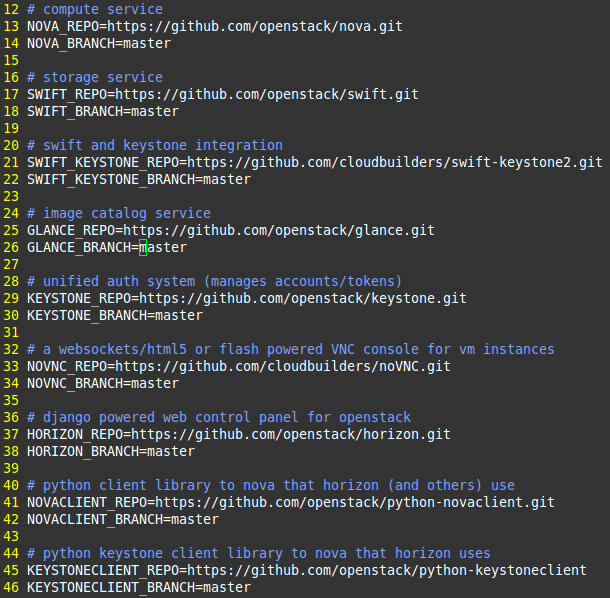 You can certainly use devstack to install a multi-node OpenStack environment, but this tutorial sticks to a single-node environment for simplicity reasons.